Godflesh have not only been one of the most influencing industrial metal bands of all times, but they have also been the first band to be reviewed on the DisAgreement Online pages. Still that didn't bring them luck, as Messiah is their farewell release. Godflesh aficionados know that we're talking here about the ultra-rare EP from 1994 that was only available to fanclub members, and if we are to believe the experts, the mid-Nineties were their most inspired time. And as a matter of fact, the four songs that were originally featured on the EP are among the best industrial metal you will ever hear, especially the title track itself. Doomy industrial metal sounding like lava flowing slowly into your body, heavy percussion, sounding organic and clinically cold at the same time, with moaning vocals emphasised by desperate screams. Where their last regular album Hymns had more concise songwriting, you get the better effect out of these older songs. Especially the production sounds top-notch, as if the last 10 years hadn't happened. So why am I giving only 7 points? Because songs five to eight are just repetitions of the original tracks, only in dub remixes from 1995. 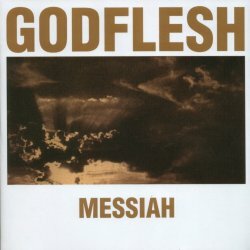 While I think that remixes are an interesting thing in itself, and especially for a band like Godflesh that always knew how to blend perfectly rock and electronics, this has the taste of making Messiah appear as a regular long playing album and therefore ask people to pay the normal CD price. In times where people complain more and more about exaggerated price politics, it would have been nice to offer this compilation of 2 EPs for the price of a mini album. Godfleshed will be missed, as this last effort proves that few bands nowadays are able to put so much atmosphere into their suffering art. Loneliness and despair have never sounded so good before and ever after.